Asthma is a respiratory condition which is caused by spasm in the bronchi of the lungs. This causes difficulty in breathing and can be a chronic condition, or due to illness coming about in sporadic attacks. Asthma causes the airways to swell which leads to wheezing, chest tightness and shortness of breath. Allergens are typical culprits for triggering asthma attacks. When treating Asthma the focus is to reduce inflammation, to improve the airway function and to reduce edema (swelling). What are possible causes, triggers and risks associated with asthma? Environmental and food allergens can cause asthma attacks. Those with asthma can test if they are producing high levels of IgG antibodies towards particular foods. Tabaco can increase the risk of asthma attacks. Occupations such as woodworking, health care professions, baking and detergent manufacturing can be associated with asthma. Viral infections during infancy and early childhood can increase risks of asthma. Certain medications such as non-steroidal anti-inflammatory drugs and ACE-inhibitors can trigger asthma. Conditions such as stress can also increase asthma attacks. How is asthma managed at Health Renewal? A comprehensive assessment is needed where the Health Renewal doctor makes a clinical diagnosis based on the symptoms and results from lung function tests. Blood testing for allergens and food sensitivities which trigger inflammation ought to be done and act as an important diagnostic tool. Asthma needs to be managed even when symptoms are not present. Patients must be able to self-monitor their symptoms and recognize warning signs of an attack in order to respond quickly with medication. 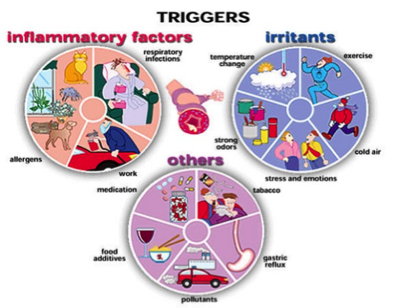 It is vital to manage your asthma triggers. Patients should reduce their exposure to known allergens. Asthma patients should exercise with caution and always under supervision. Yoga and breathing exercises may help to manage asthma. Stress should be managed well as this can also increase risk of asthma patients to eat healthy with a lot of fruits and vegetables. An anti-oxidant diet may also protect asthma patients from attacks. What supplements are recommended for asthma sufferers? Vitamin D: regulate the immune processes and anti-inflammatory reactions involved in asthma and play a role in reversing airway remodelling and airway inflammation in the lungs. Vitamin C: can decrease airway hyper-reactivity and lower the inflammation as well as improve lung function in combination with Omega 3 fatty acids and Zinc. Omega 3 and 6: can decrease the risks of asthma attacks. Zinc: May have an effect on the allergy levels as well as decreases the airway hyper-responsiveness. Magnesium: can relax bronchial smooth muscles and may improve lung function. Selenium: may decrease asthma risk and may improve clinical significant. It may also improve asthma related quality of life and lung function. Probiotic: may assist the body with the decreasing of inflammation. Curcumin: can reduce airway hyper-responsiveness, prevent the activation of Nf-kB and reduce the number of leukocytes (white blood cells) in lung fluid. Flavonoids have anti-oxidants and ant-inflammatory properties and may improve lung function. Flavonoids are supplements such as Quercetin, Proanthocyanidin (Pycnogenol), Ginkgo biloba.